I got the word ‘tween’ all wrong when I first heard it a few months ago! I thought it referred to young adults in their late teens and early twenties! There is a ‘tw’ and an ‘een’ in there, after all! So, anyway, for anyone who is as confused, or as ignorant, as we were (maybe ‘tween’ is not a British thing), the official definition of ‘tween’ is a child beTWEEN the years of 8 and 12, beTWEEN the years of childhood and adolescence. If you’ve been following along with the wonderful 30-Day Tween Parenting Encouragement Blog Party (of which this post is Day 15), you’ll know that anyway! Needless to say, I didn’t know I was parenting tweens until just a few weeks ago (when I looked up want it meant)! I’ve actually completely ‘missed’ my boys’ tween years – they are now teens! And I only have four months of tweendom left with my daughter, who is 12. I want to make the most of it (not that the teens aren’t wonderful years too). One of the things I most want to do for my beautiful tween daughter, and my three teen sons, is love them with intention. I love them. Of course I do. A lot! But I want to do more than that. I want to love my kids on purpose, not just the everyday-default-kind-of-loving (though that is a wonderful and necessary love). This post continues on the Like Minded Musings Blog. 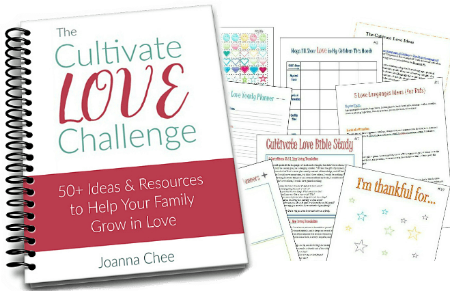 Click here to carry on reading and find out the 3 steps I use to love my kids on purpose!